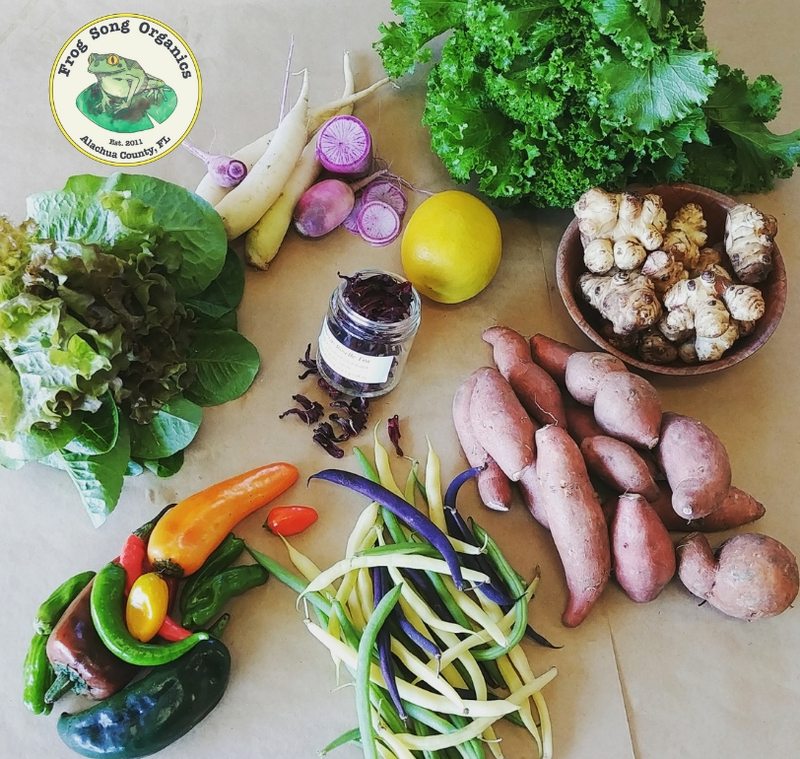 This weeks CSA share includes: Tri-colored green beans, fingerling sweet potatoes, spicy pepper medley, baby romaine and red leaf mix, long white daikon radish & purple daikon radish, meyer lemon, mustard greens, sunchokes, and dried roselle calyces- perfect for brewing tea. 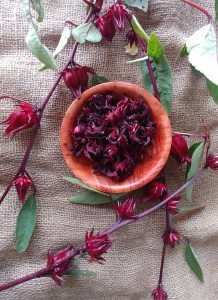 Dried Roselle- This holiday season warm up with some festive Roselle Hibiscus Tea from Frog Song Organics! The roselle calyces were hand shelled (removing the seed pod) and dried for about two weeks at the farm. This sample size portion will yield about 1 quart of tea (4 cups). Simply steep in hot water and let it cool or enjoy it warm. You may want to add a bit of cinnamon and spices, ginger, lemon and/or honey for some holiday flavor. Tri-Colored Beans- Enjoy the last week of beans. The cold snap we had last week brought us to the end of our bean abundance. The sweet, crisp beans can be savored one last time fresh, roasted with garlic, or used in some hot soup on a cold night. Fingerling Sweet Potatoes- This sweet, fingerling variety is delicious baked, mashed, pureed in a sweet potato pie or roasted in the oven. Mustard Greens- These spicy greens are part of the brassicaceae family, the same family as radishes. Did you know the seeds are ground and mixed with vinegar and other ingredients to create the mustard condiment we know and love. If you like the heat eat it raw in your green salad, burger or sandwich. If you can’t take the heat sautee them they are much more tolerant when cooked. Sunchokes- The sunchokes’ sweetness comes from Inulin, an indigestible sugar that can cause intestinal discomfort when eaten in large quantities, so enjoy sparingly. The nutty sweetness flavor of the tuber makes for a great puree or soup, however, they can be roasted, mashed, pickled and there are countless other ways to prepare them. Their versatility makes them very popular among chefs all across the country. 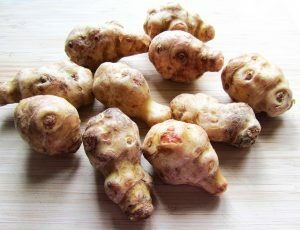 Check out this article from Seriouseats.com featuring renowned chefs and their favorite way to cook sunchokes. Meyer Lemon- Thank you Jeff from Melrose Organics. Jeff has been supplying us with his wonderful citrus crop this winter season, he grows a variety of Grapefruits, Lemons, Satsumas and Chinese Honeys. Throughout the rest of the year he supplies us with Blueberries and Figs. Order his organic, Florida grown citrus by visiting our online store. Purple & White Daikon Radish- Combination of small purple daikons and long skinny white daikon radishes. I like to simply stir-fry them with beans and other veggies but if you have an abundance of radishes piling up in your refrigerator it may be time to make a big batch of quick radish pickles or radish rice (see recipe below). Can’t take the heat? Slice raw and add a pinch of sea salt for a milder taste for a radishing snack. Radish & Turnip Fried Rice- Recipe from CSA Member Amanda McDowell at Winter Park Farmers Market. Amanda riced her radishes and turnips in the Ninja blender and used that instead of riced cauliflower for my fried “rice” base. She also added scrambled fried egg and sliced grass fed beef sausage, carrots, onions, and the squash and bok choy with some tamari (aka soy sauce that is gluten free). 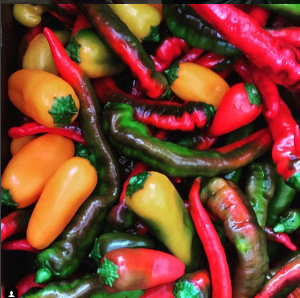 Spicy Pepper Medley- A variety of Poblano, Jalapeno, Shishitos and Corno del toro peppers grown on our farm along with Little Pond Farm in Bushnell, Florida. Combine all these spicy varieties into a pepper relish to top your mashed potatoes or mashed sunchokes. Pulse everything in a food processor so it is nice and fine. Add to a medium-size pot on the stove on medium-high heat. Add organic apple-cider vinegar, sea salt, sugar, and cornstarch. Bring the mixture to a boil and then simmer for 45 minutes, stirring occasionally. Let it cool a bit and serve. Note, you may want to wear gloves to keep the heat of the peppers away from skin. SAFE Baby Romaine- Notice we used the word “SAFE”. Our Romaine lettuce was grown right here on our 60-acre farm on the east side of Alachua County. The romaine lettuce that was part of the huge national recall last week was from California. Epidemiologic and tracback evidence from the US and Canada indicates that the romaine lettuce harvested from the central and coastal growing regions of California is likely the source of the outbreak of E. Coli infections. 43 cases in 12 states lead to 16 people being hospitalized. www.cdc.gov. Moral of the story….Eat closer to home!